Although Q1 GDP was very negative due to the sharp investment slump (this was expected, see: Q1 GDP will be Ugly), the decline in Q1 was weighted towards lagging sectors. 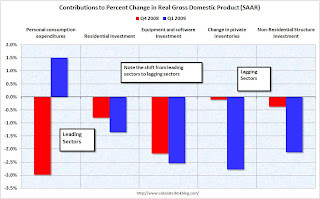 This table shows the contribution to GDP for several sectors in Q1 2009 compared to Q4 2008. The leading sectors are on the left, the lagging sectors towards the right. There has been a shift from leading sectors to lagging sectors, although the negative contribution from residential investment was larger in Q1 than in Q4 2008. However it appears that the slump in residential investment (mostly new home construction and home improvement) is slowing, and I expect the contribution to Q2 2009 to be close to zero - after declining for 13 consecutive quarters. This doesn't mean the downturn is over, but this does suggest that the worst of the GDP declines is probably over. Note: Any recovery will probably be sluggish, because household balance sheets still need repair (more savings), and any rebound in residential investment will probably be small because of the huge overhang of existing inventory. As I noted in Temporal Order, at least we know what to watch: Residential Investment (RI) and PCE. The increasingly severe slump in CRE / non-residential investment in structures will be interesting, but that is a lagging indicator for the economy.